WASHINGTON (AP) — Treasury Secretary Steven Mnuchin on Sunday called on Congress to combine a $7.9 billion disaster relief package for Harvey with an increase in the nation’s borrowing limit, saying it was time to “put politics aside” so storm victims in Texas can get the help they need. President Donald Trump visited storm-ravaged areas in Texas on Saturday, expressing hope for speedy congressional action on relief aid. But some House conservatives have said directly pairing it with an increase in the debt limit would be a “terrible idea” that sends the wrong message on overall government spending. Trump plans to meet with congressional leaders from both parties this week as lawmakers return to Washington after their summer recess. The government’s cash reserves are running low because the debt limit has actually already been reached, and the Treasury Department is using various accounting measures to cover expenses. 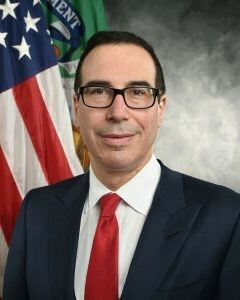 Mnuchin originally had said that Congress would need to raise the $19.9 trillion borrowing limit by Sept. 29 to avoid a catastrophic default on the debt, allowing the government to continue borrowing money to pay bills like Social Security and interest. But on Sunday, he said that deadline had moved up due to unexpected new spending on Harvey. “Without raising the debt limit, I’m not comfortable that we would get the money that we need this month to Texas to rebuild,” Mnuchin said. The Associated Press reported last week that Republican leaders were making plans to pair Harvey aid with an increase in the debt limit. Other senior GOP aides told the AP that no final decision had been made, and Democrats, whose votes would be needed in the Senate, are cool to the approach. In an interview with a Milwaukee TV station that aired Sunday, House Speaker Paul Ryan did not address whether the two issues would be tied together, only expressing confidence that Congress will “step up” to fund disaster recovery efforts in Texas. “This is something that we’ve never seen before, so it’s going to require a pretty unprecedented response,” Ryan, R-Wis., said on “UPFRONT with Mike Gousha,” which is produced in partnership with Wispolitics.com. “The president’s attention to this issue I think puts another reason on the table to get things done in September,” Blunt said. Trump’s aid request would add $7.4 billion to dwindling Federal Emergency Management Agency disaster aid coffers and $450 million to finance disaster loans for small businesses. An additional $5 billion to $8 billion for Harvey could be tucked into a catch-all spending bill Congress must pass in the coming weeks to fund the government past Sept. 30. On Sunday, Texas Gov. Greg Abbott described the federal aid package as an important initial “down payment” on Harvey relief that he expects will come to $150 billion to $180 billion. “We need Congress to step up and pass this and help Texas rebuild,” he said. More than 436,000 households have registered for FEMA aid, according to the White House.